"My daughter will have 0% chance of survival without a liver transplant. She hasn't lived 5 or 50 years for us to consider other options. No. She is 5 months old, and she has been suffering every day." 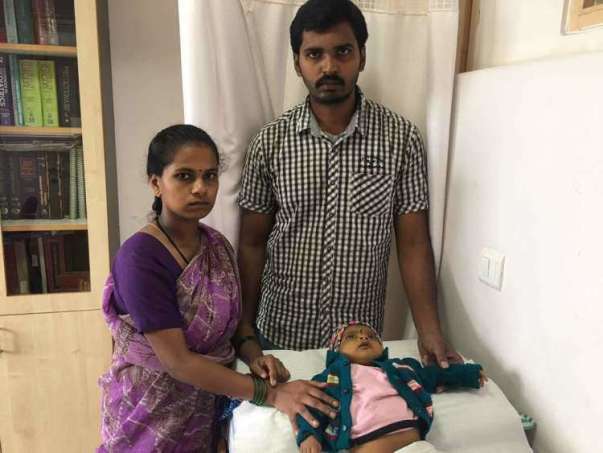 It struck these parents odd when their baby girl had jaundice for over 2 months despite treatment. Their world shattered when they learned she had a chronic liver problem. Benakashree needs a liver transplant urgently, otherwise, it would be very difficult to save her life. Shilpa and Suresh are from a village near Shimoga where Suresh works as an accountant for Rs. 10,000. They were comfortable enough to start a family and could not conceal their joy when their daughter Benakashree was born. Even as a newborn, she was a happy baby who lit up the room with her beautiful smile. "When she was around 1 month old, Benaka got jaundice. It is common for babies her age, and we took great care. Even after 1 month of treatment, her symptoms did not reduce and that is not normal. We took her to a local hospital and there they diagnosed her of a liver problem. When she was around 2 and half months of age, she had a gall bladder surgery, but it did not help." Racing against the clock. She has just few days left. 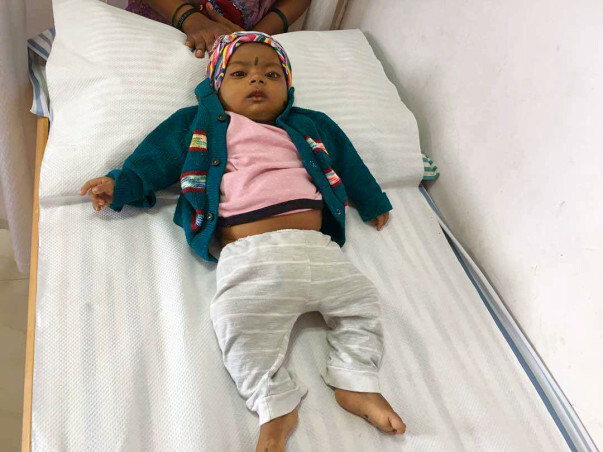 Baby Benaka has Biliary Atresia. Her bile ducts are blocked due to which her liver is failing, and it is hardly functioning at this point. So far, she has been on medical management, but time's running out to save her. The first surgery cost Rs. 50,000 which Suresh was able to fund from his savings. Now, a liver transplant is the only curative treatment and the estimated cost of Rs. 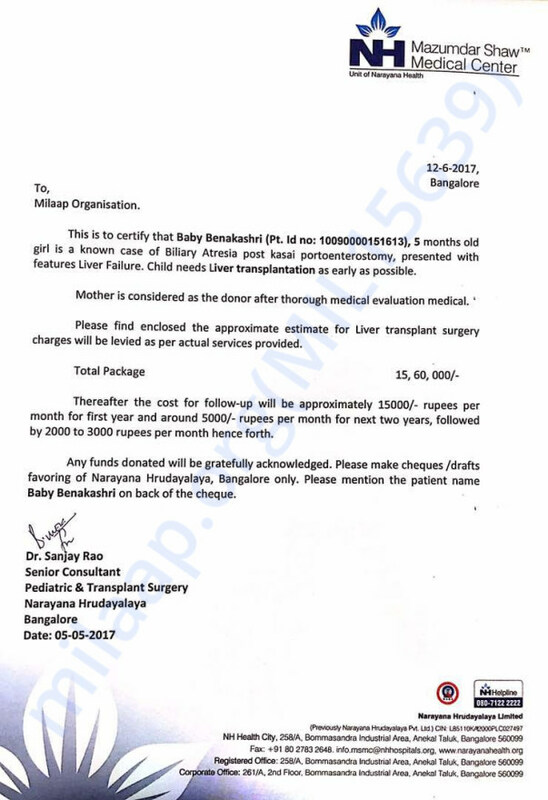 15.6 Lakhs in addition to post-transplant expenses of Rs. 15,000 every month is something this family cannot afford. Suresh has been reaching out to his friends who have come together to support him. They are crediting whatever they can afford - Rs. 1,000-3,000 - for Benaka's treatment. 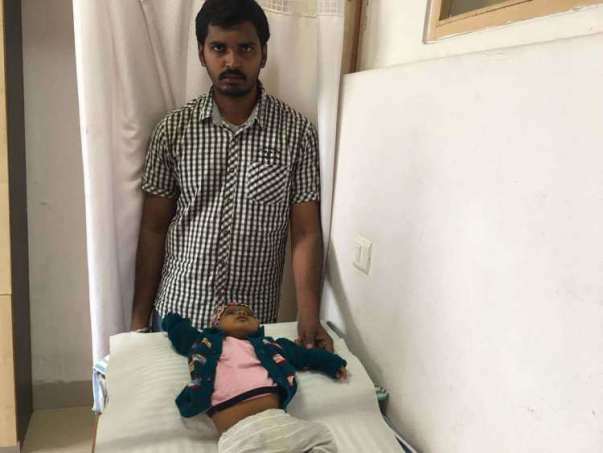 He has taken unpaid leave from work to stay by his daughter's bedside in Bangalore until the worst has passed. Both Suresh and Shilpa need hope in this dark situation. "We are extremely stressed thinking about her survival, and the only thing keeping us going is her smile. Despite what she is going through, she is active. She is smiling all the time, kicking around. Once they bring in those injections and start poking at her when she gets worse, then we will lose that smile. I know every parent would say it, but I want my daughter to stay alive. 5 months? That's not a life." Benaka's chance for survival is 0% without this transplant, and it has to happen soon before her condition deteriorates further. You can help this baby girl live. Thank you for the support that you have shared towards Benakashree. She is doing good now. It has been more than 8 months after her transplant and she has developed no infections as such. All her reports are also normal. Thank you all once again. Your support helped her receive the best medical treatment possible. Here is an update on Benakashree’s health. I have something great to share. She was operated on 24th July. The surgery was successful.Both the mother and daughter are stable. She will be in ICU for another two days and then shifted to general ward. Her mother who had donated a part of her liver is also keeping well. Benakashree will be kept under observation for the following two weeks before getting discharged. Later she is advised to visit the hospital for follow up check-up. Her family is extremely happy with her recovery and very grateful for all your support. Please keep her in your prayers. Thank you, everyone, for the support and care you have given to Benakashree. She is doing better now compared to before. The fever has also reduced. The doctors have advised that she will be operated on 20th July 2017. There are few tests that have to be taken up and if all goes well, she will be admitted tomorrow. Her mother will be donating a part of her liver. She has completed the testing and other check-ups; she is waiting to take her baby home along with her. Thank you all for the overwhelming love and support. Please do pray for her recovery.